Would you like to read about the emerging 21st century conflict between public/private security partnerships and adverse private armed groups? 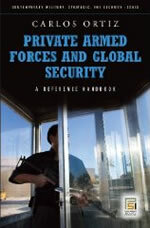 PrivateMilitary.org is pleased to introduce Private Armed Forces and Global Security, the first academic title approaching Private Military Companies constructively and not as dangerous forces. This is a featured item page, please use the menu on the left to return to the Books main page, or select any of the options below. · The private military labor market · The time to privatize peace? · The new managerial strategy · A new security paradigm or rushed privatization?